Daily Adventures of the SAHM: VIP Fabfitfun Winter Box Review. You know you're jealous. 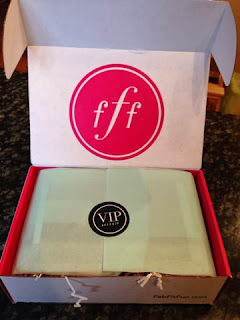 VIP Fabfitfun Winter Box Review. You know you're jealous. 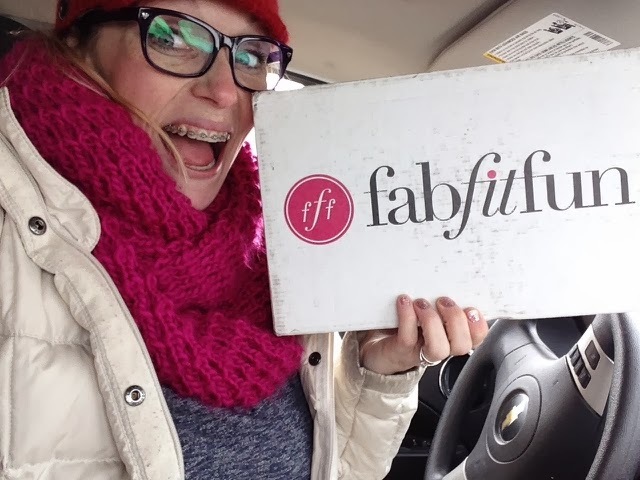 Shortly before New Years I got a notification that a quarterly fabfitfun box had shipped out to me but - my bad - I had never updated my address and it was being sent to the little blue house that is no longer our home. In a panic, I selected a FedEx pickup location about 40 miles from my cozy spot on the couch and eagerly anticipated the surprises that awaited me when the beautiful white box would finally be in my greedy grip. Friday, E and I trekked into the zero degree winter weather so I could collect said box (and go to a Coach Factory store, but I digress). I told myself I'd wait to open the box until I got home and had the toddler down for a nap, mainly so I could relish in each item and savor the moment of scouring through the health and beauty goods, curated by the beautiful and inspirational Giuliana Rancic. Because, surely, if its good enough for her it's definitely good enough for this mama. The wait for 1 pm's sleep session couldn't come quick enough. And no, I'm not just saying this: I definitely wasn't disappointed. Chocked full of goodies ranging from skincare and cosmetics to pampering and encouraging a healthy lifestyle, this may be one of my favorite boxes to date. 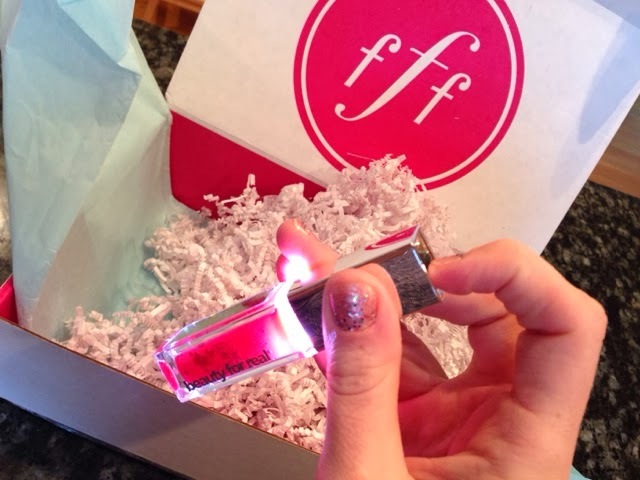 For a $50 fee, customers received $274 worth of goodies! 1. Simple Foaming Facial Cleanser: $7.49 - I'm newer to this drugstore brand but I've rapidly become a fan. This is going directly into my cleanser rotation once I use up my almost-gone bottle of Clinique. 2. Physique 57 Classes: $25 - This is a coupon for 5 classes to download. As it expires on March 12th, I'm thinking I won't get to utilize this before it expires since my due date is late February. I plan to pay it forward to a friend I think will really get to take advantage of the workouts and appreciate it. 3. 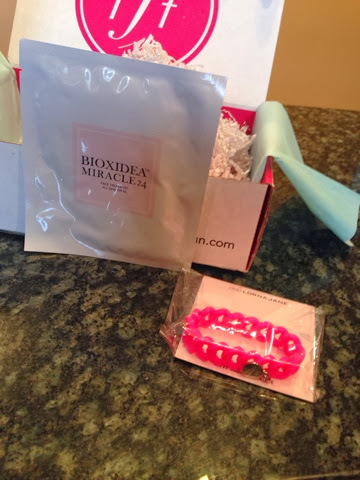 Bioxidea Miracle 24: $19 - This one face mask is $19. $19!! It's a nutrient-infused, cutting-edge face mask that is said to smooth skin and reduce signs of premature aging. Looks like I'm going to be rocking this bad boy while I soak in the tub tonight! 4. Lora Jane Bracelet: $29.99 - This is a fitness bracelet intended to remind you to "Move, Nourish, and Believe". I'm not huge on fitness bracelets (heck, I used to hate even wearing my Tiffany bracelet while I ran, and that sucker NEVER came off. Until it did and I lost it in the middle of a Walmart store, but that's another story for another time) but I like the message behind this one, to remind you to take care of yourself. 5. 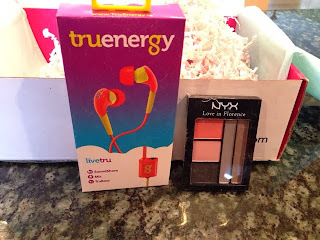 TruEnergy Inspired Earbuds: $39.99 - Um, hi. My name is Buffy and I adore funky anything. Some bright yellow and orange earbuds that feature superior sound quality, enhanced bass AND noise reduction? Um, okay. Where do I sign?! Plus it has a built-in SoundShare splitter so your friends or boyfriend or girlfriend or sister's cousin's mother can listen in to your tunes like a creepster. 6. NYX Eyeshadow Palette: $8 - I feel like I'm late to a very, very awesome party. 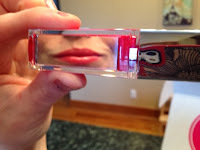 NYX products are highly pigmented and AFFORDABLE. 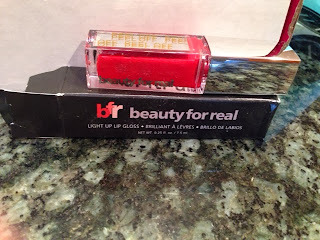 This 5 color shadow palette is in Ciao Bella and I'd say that the majority of colors are really flattering on my typically pasty and freckled face. There's a bolder coraly pink that is a little weird for me. It's more like a blush shade for me rather than something I'd wear on my lids, but the rest of the colors are definitely winners. 7. 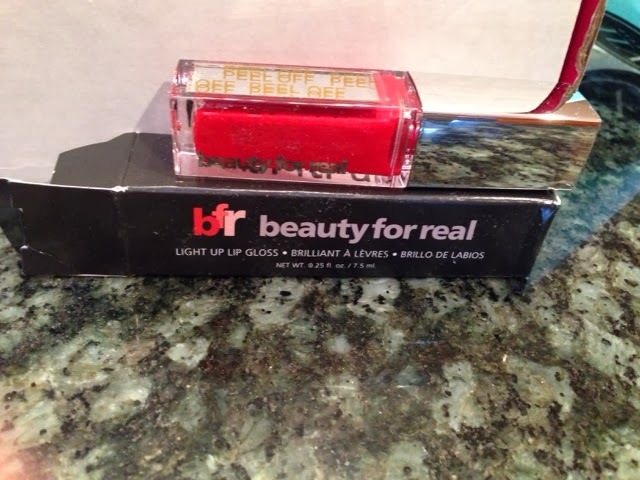 Beauty for Real lip gloss: $22 - I'm obsessed. Not only is the color super flattering while still bold, it's a little tingly on my kisser. I like tingles. 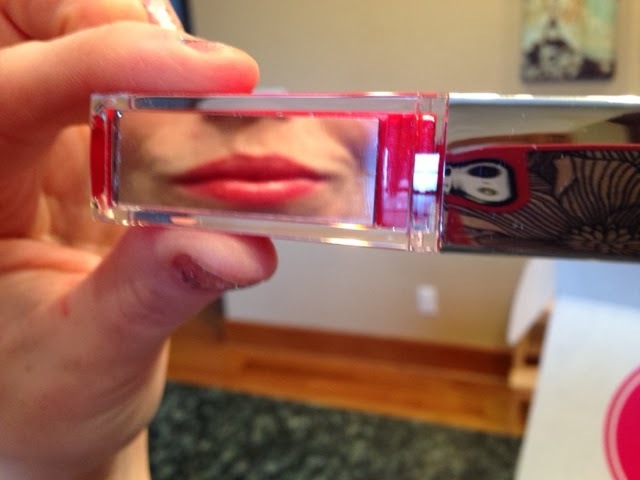 ALSO there is a mirror on the side and a little light in the wand. I dig the color, but if I didn't it'd still be awesome to keep in my purse for searching for parking meter quarters. 8. Skyn Iceland Icelandic Relief Eye Cream: $45 - I haven't busted out this bad boy yet, but as I'm starting to spot a few fine lines around my eyes (it must be the looming 30's creeping up by way of wrinkles) I'm excited to test this blend of vitamin K, peptides, cotton powder and Icelandic kelp. Because Icelandic kelp is way better than kelp from, say, Florida. 9. MeUndies Gift Card: $20 - it's really more of a coupon code than a gift card, but it's enough to redeem for 1 pair of undies from the site (or, as your girl here did, I redeemed for two pairs of socks). I haven't received said socks yet, but I placed my order around 2:30 and by 4 pm I had a shipment confirmation in my inbox. This makes me giddy. 10. 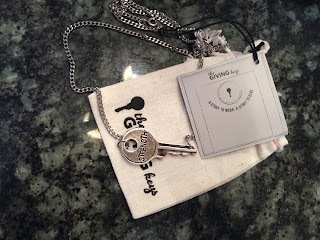 The Giving Keys Never Ending Necklace: $55 - At first blush I was a little unimpressed by this necklace. It's a little key with a single word meant to motivate. But upon further research, the necklace is intended to be worn until you meet someone who needs the message more than you, at which point you pay the key forward and instruct them to do the same. Given that I'm about to pop a kid out of my uterus, I think the message (mine is 'strength') couldn't be more perfect or applicable. It's now hands-down my favorite item in the box, even more than the badass dayglo headphones. Overall, I'm super giddy about the content of this box. 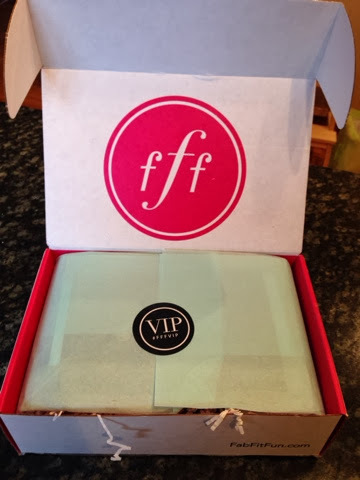 If you want to check out the box for yourself, direct your booty over to www.vip.fabfitfun.com so you can also get these amazeballs quarterly boxes o'happy!